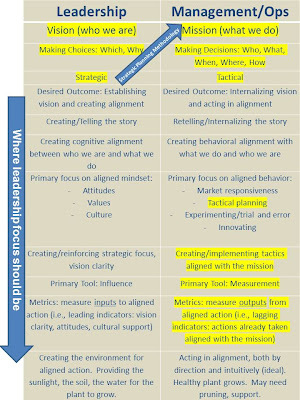 The graphic below clarifies why traditional strategic planning methodology misses the mark in terms of leadership focus, and shows where leadership focus should be. This isn't rocket science, but for some reason it's a concept that not only many, but most, organizational leaders seem to be missing (including me until recently). The un-highlighted areas are generally left out of the process or, if discussed, only in relation to creating and implementing the plan. Most strategic planning processes/retreats start with things like a SWOT analysis, environmental scans, etc. , to help determine the strategic choices. This is followed by creating or re-examining the vision/mission, then developing some areas of strategic focus, creating goals/objectives, and may even go so far as developing action plans. It should now be clear why strategic planning methodology fails to build a strategic organization. True strategic leadership activities are either skipped or given short-shrift at best, and an inordinate amount of time is spent on management/operations activities where leadership should spend NO TIME AT ALL. Strategic planning methodology quickly shifts the focus from leadership to management. When a leadership retreat is held, instead of shifting the focus to management/operations activities, the entire focus should remain on the leadership side, NEVER venturing into the right-hand column. Ever. The right-hand activities are for mid-management and staff, and in nonprofit organizations, this would include committee chairs and volunteers. When building a strategic organization, the left-hand side is where leadership, the C-Suite/owners/Board of Directors, should be focused like a laser. And executive leadership should not only stay focused on the left side, but build capacity within the rest of the organization to shift its focus to the left-hand side. That's an important piece often left out. Leaders by nature have a visionary, strategic-focused mindset and attitude, but often fail to build capacity in the rest of the organization for a strategic leadership focus. The un-highlighted activities in the left column are the ones that build organizational capacity for strategic leadership at all levels. Ultimately, we want what we do as an organization (behavior - mission/tactics) to be aligned with who we are (mindset - vision/values/strategic focus). Leaders need to focus on reminding us of who we are as an organization; aligned actions will follow automatically if all stakeholders have an ingrained, intuitive understanding of this. How many times do we as leaders complain of getting bogged down in operations, losing sight of the "big picture?" We say to ourselves, wouldn't it be great if we could work on the organization, rather than in it? It stands to reason, if we're getting sucked into operations, then what about the people in our organization whose only focus is operations? If we don't take the time to build strategic leadership capacity in them, they'll never get out of an operational focus, which they must do in order to take thoughtful actions aligned with the vision. Since we now know where our focus needs to be to provide strategic leadership, we'll take a look at how to keep it there in upcoming posts. In my next post, I'll be offering a thought that goes counter to prevailing wisdom about creating vision.